Losing weight is difficult because you must burn 3,500 calories more than you consume to lose one pound. You also must consume more calories than you normally consume if you want to have the energy to exercise vigorously. 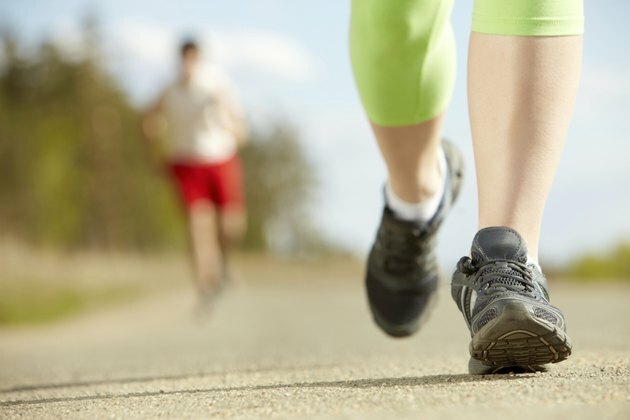 Jogging burns far more calories than walking in the short term, but also makes you more susceptible to an injury that will impair your weight-loss efforts, according to The Merck Manual of Medical Information. Walking is an excellent long-term weight-loss exercise. Calories are a measurement of energy. Skimping on calories can make you too lethargic to have the energy to exercise. How many calories you need depends on your activity level, gender and weight. A man who weighs about 185 pounds needs to eat 3,100 calories a day to have enough energy to exercise for 30 minutes and 3,300 calories daily to exercise for an hour according to "An Invitation to Health." A 155 pound man needs between 2,600 and 2,900 calories daily, for the same amount of exercise. Women need fewer calories than men who are of the same weight. A primary factor in this discrepancy is that the average man has about twice as much muscle mass and half as much body fat as the average woman of the same weight and muscles require more energy to operate efficiently than fat does. A 155 pound woman needs about 2,400 calories to exercise 60 minutes daily, and 2,150 calories to exercise 30 minutes daily. A 125 pound woman needs about 2,100 and 1,900 calories daily, respectively, for the same amount of exercise. People burn calories throughout the day, even when they are sleeping. A 185 pound man who did desk work for eight hours, slept for eight hours and was sedentary for six hours burns approximately 1,200 calories, according to Harvard Health. That means he would need to burn 2,101 calories in his other two hours to lose weight. Jogging 7.5 mph for two hours burns 2,020 calories in a 185 pound man. Jogging 7.5, 6 and 5 mph burns 1,010, 888 and 710 calories per hour, respectively. If you're active throughout the day, it's much easier to lose weight. A 155 pound woman who is active throughout the day could lose about 2,000 calories without formally exercising. That means she would only need to burn 401 calories in two hours of exercising to lose weight. A 155 pound woman burns 930 calories jogging 7.5 mph for one hour, 744 calories jogging 6 mph for one hour and 596 calories jogging 5 mph for one hour, according to Harvard Health. The average 185 pound man burns 444 calories walking 4.5 mph for one hour, 400 calories walking 4 mph for one hour and 356 calories walking 3.5 mph for one hour, according to Harvard Health. The average 155 pound woman burns 372 calories walking 4.5 mph for one hour, 334 calories walking 4 mph for one hour and 298 calories walking 3.5 mph for one hour.